We have all been waiting for a long time for The New Fantasyland to open up for guests and on December 6, 2012 it finally happened! On my recent trip I got to experience Fantasyland and I am happy to share my thoughts with you! I got to the park at rope drop which ended up being the best idea as crowds soared as the day went on. After tackling a few of the bigger rides such as Big Thunder Mountain and Splash Mountain, I boarded the train to Fantasyland. The train station lets off at Storybook Circus where you will find Dumbo, The Barnstormer, and Pete’s Silly Sideshow which features a meet and greet with Minnie, Daisy, Goofy, and Donald as circus characters. My suggestion is to head to Belle’s Village and skip Storybook Circus at first. If you have a little one that wants to see Belle, you need to get in line for Enchanted Tales with Belle first thing! I was over here 30 minutes after park opening and the line was already an hour long. It is however, important to note that this is not a meet and greet in the classic sense. This is a retelling of Belle’s story by the princess herself and guests are selected to participate in a reenactment of the tale. This is not a photo and autograph session. Currently there is no fastpass available for this attraction. Guests enter the attraction through Maurice’s Cottage which is a true work of art with no detail spared. If all you are looking for is an autograph and photo you would be best advised to skip this attraction and meet with Belle elsewhere. 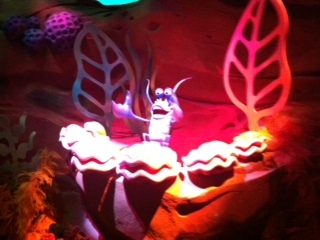 Under the Sea- Journey of The Little Mermaid is the only “ride” that is currently open in this section of Fantasyland. It is certainly a beautiful ride and I enjoyed it completely. The queue is fantastic and it is worth waiting in line once to see the detail. The ride itself is very fun, but in my opinion it is not finished. I just had a feeling that there was still more detail to be added. We will see in months to come if I am correct! The music of course, was phenomenal! The Little Mermaid has many of my favorite songs and the ride does not disappoint! I do have one warning for parents: Ursula is GIANT and I can imagine would be scary for small children. You are given fair warning of the approach into her lair, but if you have a worried child, you may want to reassure them here! 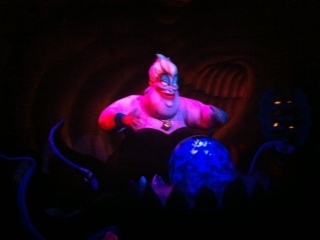 After riding the attraction you can meet the mermaid in the flesh (Scales?) 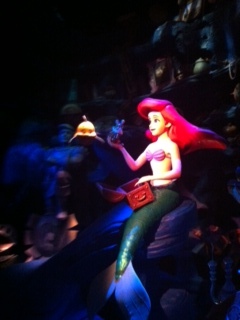 at Ariel’s Grotto. 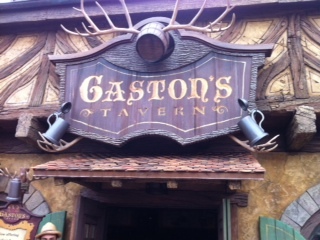 Beyond these attractions you can also find Be Our Guest Restaurant and Gaston’s Tavern where you can find snacks and the signature Le Fou’s Brew beverage. After you have seen Belle and ridden The Little Mermaid ride, head back towards Storybook Circus for a fastpass to Dumbo and a ride on the Barnstormer. Later this year, Princess Fairytale Hall will open. This will be the place to meet the Princesses and get autographs. 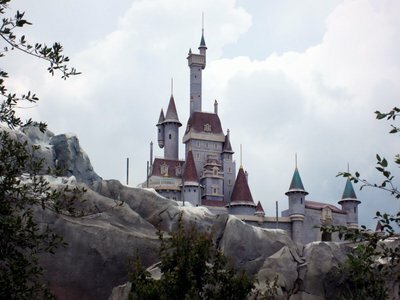 In 2014, The Seven Dwarfs mine train is expected to open which will be a brand new coaster which is the part of the expansion I am most looking forward to. 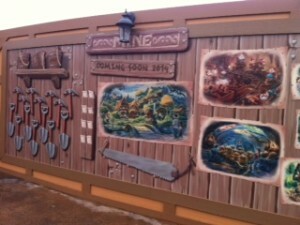 If rumors are correct, we may see the soft opening for this ride in late 2013! Looking at the construction on this ride, I can see how an early opening is possible. There have been drastic changes here even since I last visited in October! Lets hope the quick work continues! The Fantasyland Expansion was done extremely well and even though there is currently only one new ride (Barnstormer was just re-themed and Dumbo was expanded but is not a new experience.) It is still well worth checking out! This entry was posted in Fantasyland, Magic Kingdom, Planning Tips, Rope Drop and tagged ariels grotto, Be our guest, belles village, fantasyland, gastons tavern, journey of the little mermaid. Bookmark the permalink. ← Top 10 Things to Cool you Down!